Tony and Kent are proud to announce that they have joined HDR’s Denver architecture studio as leaders of its landscape architecture department. PLOT Project, LLC will remain operational to complete existing work that is under contract. All new projects will be contracted under HDR with the same level of service that you have come to expect. Tony is a site design principal, and Kent is a senior landscape architect in the Denver studio. They are looking forward to joining forces with the talented architects, landscape architects, interior designers and engineers at HDR to deliver personal, integrated design services to the Denver community and Rocky Mountain region. Kent is in on vacation and enjoying the urban tree canopy in Oak Park, IL. Below are Oak, Japanese Maple & Ginko street trees. This month we received final CU Design Review Board approval for the CU- Boulder Aerospace Engineering Sciences Addition Project. For more about our AES work check out Flight Field in our portfolio or the March 2017 post here in THE LATEST. The original project broke ground late last year (see Kent with Ralphie masquerading as an astronaut below ). Spring is on the horizon and we turn our attention to revitalization and renewal with these opportunities in the corporate market, invigorating existing but commonly underutilized outdoor spaces. This work transforms tired plazas and demanding stretches of bluegrass into beautifully activated spaces, relevant to the way people in Colorado enjoy the outdoors. As spring approaches, we are excited about these two Tech Center projects which prioritize human and environmental well-being. Liberty Media Plaza (pictured above) is breaking ground this spring. Metro Point Plaza is on the boards - emerging along with the warmer weather. After a year of rewarding focused design and documentation, this exciting project broke ground today with an impressive, well-attended ceremony with dignitaries from the University, Governor's Office, State House & Industry Partners, as well as many CU staff, students and faculty. PLOT extends thanks to the CU staff, DRB and our design teammates (primary partners HCM/RATIO architects, JVA civil engineers & Great Ecology environmental consulting) and our own staff -- Kelly, Chris and Peter for your amazing work with Tony and me. Here I took my turn posing with one of the stars of the day, who really got into the spirit of the occasion! A friend and former colleague sent us these snapshots of the first season's growth in the rain gardens at our MOVE project down in Castle Rock. Thanks Kyle for the photos and your great work on this project! Venturing out of our office during the near total eclipse here in Denver (92%), we noticed phenomena on the ground was as interesting as the one in the sky - as the photos below illustrate. This spring finds us busy in design development for CU Boulder’s new Aerospace Engineering Science facility. We are tasked with creating a landscape that sets the stage for a unique East Campus identity that is thoughtfully contemporary, but still connected to the identity of CU's iconic Main Campus. This landscape will support the unique needs of AE students to test various flying apparatus, perform an ecological service through integrated storm water management, and provide a beautiful setting for events, class discussions, and other activities. Stay tuned as this exciting project evolves! Dillon Valley Elementary School Playground Improvements - Construction has been completed on this project that PLOT began working on in 2014 to help secure GOCO grant funding. New planting, drainage improvements as well as playground equipment have transformed the east side of the school grounds. of the Main campus but not bound by the same history and traditional typologies. Glenwood Springs Elementary School - PLOT, and the design team led by H+L/Treanor Architects, delivered Design Development documents to the District this month and presented the landscape design to the Executive Committee. Below are some images of "the school in a forest" concept. The MOVE - Our office/retail project in Castle Rock, with BRS Architecture, is nearing completion. The planted storm water filter vaults (located in the ROW) were recently installed. 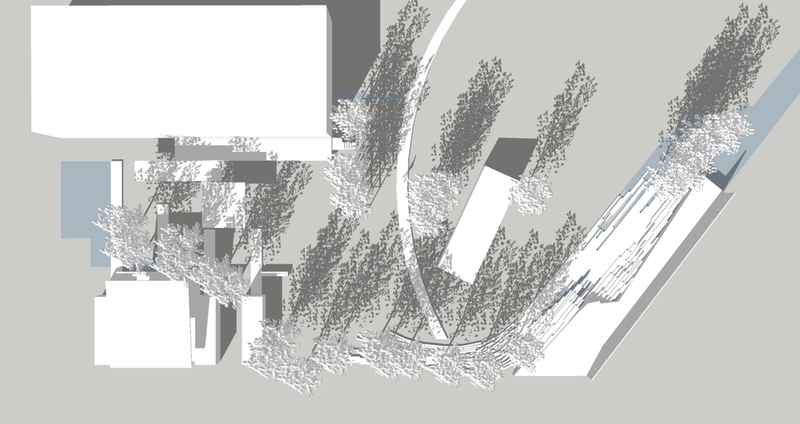 GRACE (Globeville River Arts CEnter) - PLOT is re-imagining another post-industrial site into a functional garden. A burgeoning artists community moving into a former meat packing facility needs outdoor spaces for art market displays, concerts, metal working, bee-keeping and gardening. 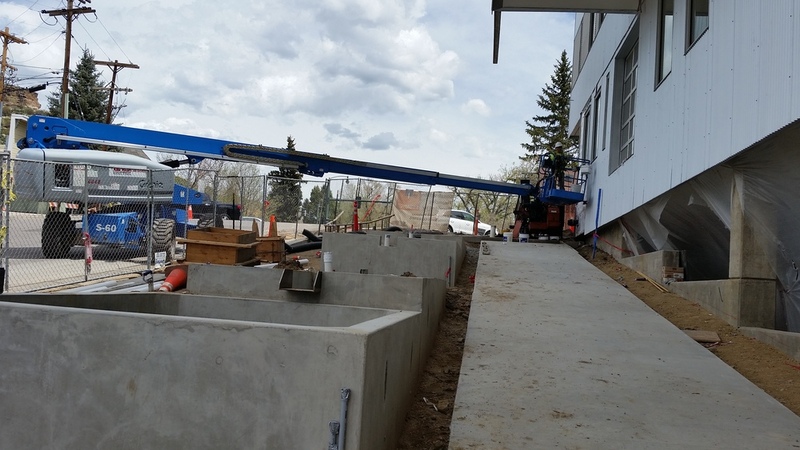 Glenwood Springs Elementary School - PLOT is working with H+L/Treanor Architects on transforming this school building and site, founded in 1921, into a 21st Century Learning environment serving their Expeditionary Learning curriculum. Schematic Design was delivered at the end of March. An intensive green roof at Colorado State University Pueblo that PLOT designed in association with Demmon Design Studios is nearing completion with the installation of pavers well underway. Planting will begin this Spring. PLOT kicks off the new year with three additional projects showcased in our Portfolio! Check out some highlights from our playground design and master-planning work with Great Outdoors Colorado at six elementary schools across the state of Colorado. We also show our design process and renderings of The Move a commercial office building (currently under construction) and our concept courtyard design for Priory (a residential community for the Dominican Friars). We are moving back to RiNo! The doors to our new home will open on 12/01/2015. You can find us at 1350 31st Street Denver, CO 80205 in the heart of the River North Neighborhood. The new office is located just blocks from Curtis Park, a short walk from the 30th & Downing lightrail station, and right off the Larimer Street bike lanes in the midst of Denver's art and design scene, the finest craft breweries, and up-an-coming urbanist community. Our thanks to The Pink House, Civitas, Arch 11 and all the other creative firms who welcomed us at 1200 Bannock over the summer. 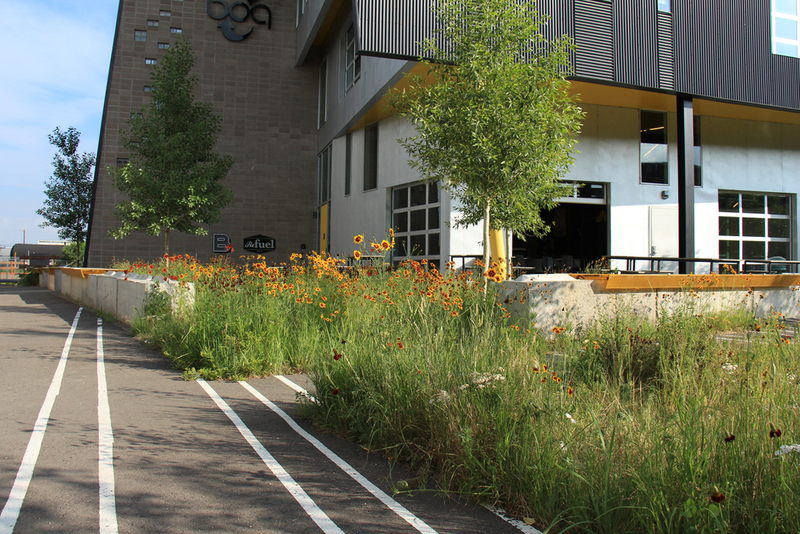 For the second straight year, PLOT wins an ASLA Colorado Chapter Design Award! This year FR8scape Plaza and PLD, at the TAXI development, received a Merit Award for Design in the built work under $500,000 category. 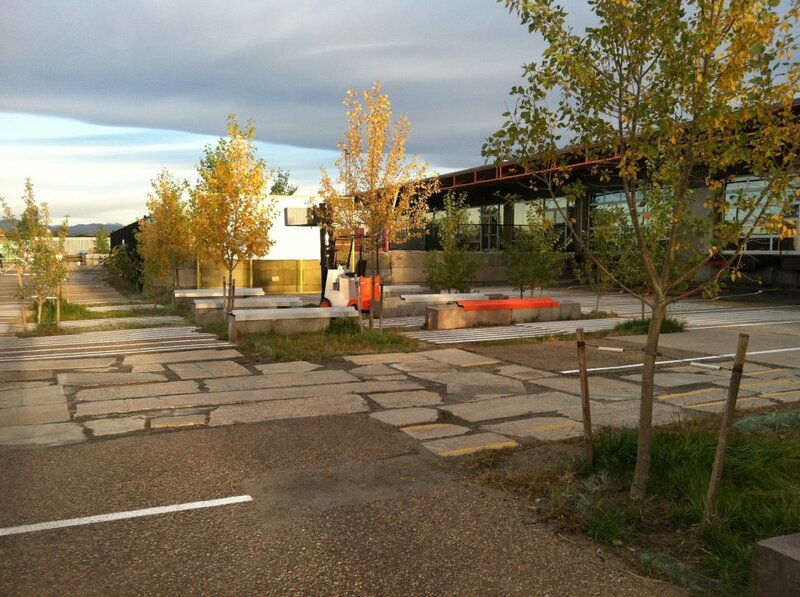 View the winners on the ASLA Colorado Website here. The landscape at FR8residence condos is now under construction. 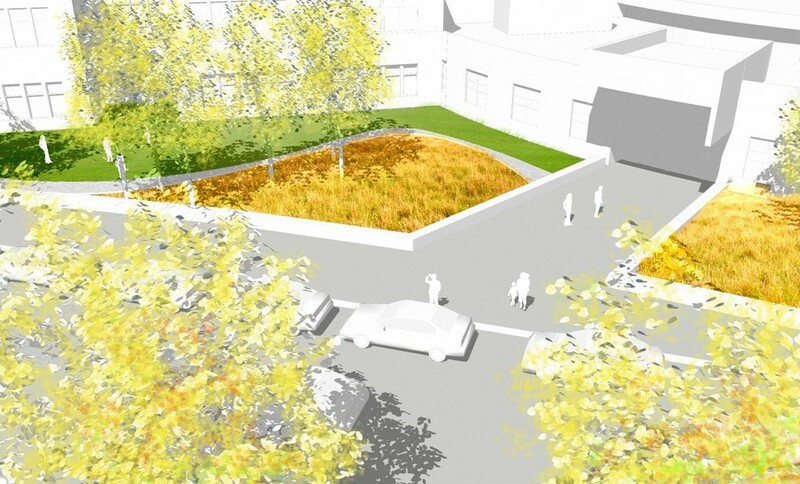 This is the fourth project that PLOT has designed at the TAXI campus. The images below show the bin block retaining walls and grading at the rain garden. 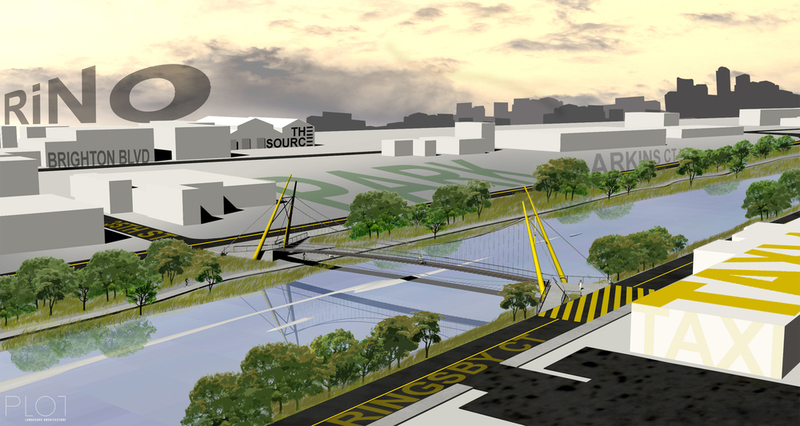 Aluminum bridges will span the densely planted rain garden creating a welcoming entry experience for residents. Kent Freed, RLA, AIA joined PLOT in July 2015 bringing 30 years of landscape and building design experience to the firm. Kent worked with PLOT's founder, Tony Mazzeo, previously and the two are excited to join forces again. Kent's extensive project experience in healthcare and education, both K-12 and higher-ed, will expand PLOT's current client-base. His team-building and project management experience dovetail well with Tony's exceptional design talents. Likewise, Kent's penchant for detailing and construction administration parallel Tony's passion for bringing conceptual design to life. Check out some of Kent's previous projects here. PLOT relocated to 1200 Bannock in Denver, next door to the new Denver Art Museum's new Administration Building and across the street from the new location for the Kirkland Museum, now under construction. Two projects out of all selected winners may be honored with the President’s Award of Excellence if so determined by a unanimous vote of the jurors. This award is of an outstanding contribution in the advancement of the Landscape Architectural profession, which exemplifies the ethics upon which the profession was founded. PLOT is excited to announce our newest partnership with GOCO (Great Outdoors Colorado)! 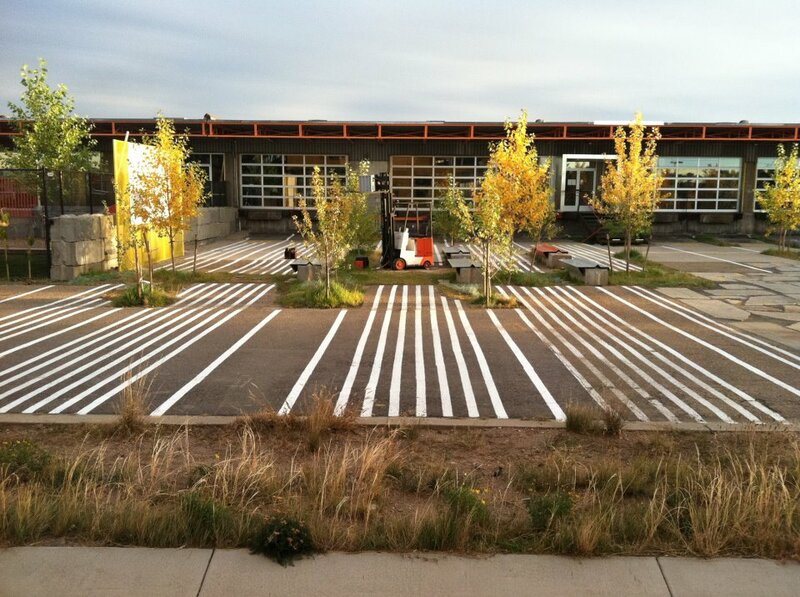 We will be re-imagining nature inspired play-scapes at six Colorado schools that are situated along a state-wide ecological transect connecting the western slope with the eastern plains.